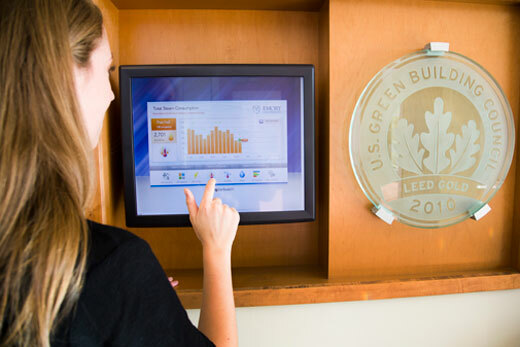 Energy monitors in some campus buildings, such as this one in Few Hall, allow users to track energy consumption, encouraging them to be mindful about sustainability. The monitors, as well as LEED certification, are just two of the many efforts that helped Emory reach its "25 percent by 2015" energy reduction goal. Emory Photo/Video. In 2005, Emory pledged to reduce energy usage per square foot by 25 percent in 10 years. 2015 hasn't yet arrived, but thanks to a shared vision and strong commitment to sustainability, the university has exceeded the goal ahead of schedule. "Sustainability was a major theme that emerged from Emory's strategic planning efforts and efficient energy consumption is an important component of sustainability," says Mike Mandl, executive vice president for business and administration. "If we want to contain costs and allocate a higher proportion of resources to the academic mission, reducing energy consumption and associated costs must be a very high priority." Achieving the goal required extensive engagement across all levels of the university — from administrators who saw the wisdom of investing in energy efficient systems for both new and old buildings to every individual who turned off a light or an appliance. "While investment in technology and more energy efficient systems played a significant role, there is no way that the goal would have been reached without the changes made by faculty, staff and students," Mandl says. The conservation goal was part of the university's 10-year Strategic Plan and includes electricity, natural gas and fuel oil use. Energy is one of the largest non-personnel expense categories at Emory. In 2005, Emory spent a total of $24.8 million on utilities for the year. To meet the 25 percent per square foot reduction goal, the university aimed to reduce energy consumption per square foot from 217 kBtu to 162.7 kBtu by 2015. The reduction goal was based on energy use per square foot, rather than a total dollar amount or total amount of energy used, because "we knew we would grow," explains anthropology professor Peggy Barlett, who served with Mandl as co-chairs of the visioning committee that set the goal. "The 25 percent per square foot reduction goal was considered very ambitious when set by the visioning committee in 2005," notes Ciannat Howett, director of the Office of Sustainability Initiatives, which was created as part of Emory's commitment to the strategic plan goal. "It is exciting that Emory has achieved this important reduction goal, and achieved it ahead of schedule." New construction is now built with energy efficiency as a priority. "We realized LEED certification was a good thing for us and that led the Board of Trustees to adopt a recommendation that came from Campus Services that all new buildings on campus would be certified at the LEED Silver level," Barlett says. The Utility Reduction and Energy Conservation Agreement (URECA) that seeks out ways to make buildings more efficient via energy reduction projects such as lighting, weatherization, and heating and air-conditioning ventilation. The temperature policy to set thermostats to 68 degrees in winter and 76 degrees in summer. "I was amazed at how willing everyone was to do this and I feel that was a huge benefit in helping us get to our goal," says Matthew Early, vice president of campus services. The Sustainable Performance Program (SPP), a predictive maintenance program for high performance buildings. "Buildings went from operating at 217 kBtu to 76 kBtu," Early says. "That just shows you how dedicated Emory is to investing with high quality, efficient systems for our buildings." The Building Sustainability Representatives program. The representatives, who are staff members appointed by their dean or department head, serve as ambassadors for every major building on campus, help implement programs and work with building occupants around creating a culture of conservation. Retrofitting building systems was also essential to reaching the goal, Barlett says. "We've been able to go back and retrofit a lot more than we thought. So now we have a robust collection of buildings that have been made much more energy efficient," she says. Still, the most credit for successfully reaching the goal goes to the people at Emory. "There are some optimization strategies that can be implemented behind the scenes, but most energy conservation measures require the acceptance of occupants since they ultimately see the results whether it is new light fixtures; cooler temperatures in winter; reduced office appliances such as mini-refrigerators, coffee makers, printers, et cetera," says Joan Kowal, senior director of energy and utilities in Campus Services. For Early, Emory is "an example of how it can be done, big institutions making change. It takes a full team effort — behavioral, cultural — as well as technology. Technology just can't do it all. It takes a commitment from senior leadership to finance and to believe there's a payback." Barlett also praised "truly extraordinary leadership on the part of our administrators to translate what is sometimes just vague aspirational language into specific deliverable goals. "We took advantage of a lot of opportunities and other schools can now benefit from our experience," she notes. The energy reduction goal fits with Emory's educational mission and values, Howett says. "What's different about Emory's sustainability mission from so many other schools is that we have married the operational and academic, so that so much of our work is about creating a culture of conservation and also about creating co-curricular educational opportunities for our students, faculty and community members," she says. Mandl thinks that attaining the energy goal sooner than targeted "shows that with goals set via participatory processes and leadership both centrally and locally — reinforced and communicated regularly and monitored with discipline and rigor — real change can occur." While celebrating achieving the energy reduction goal, Emory leaders are already looking to the future. "We should celebrate what has been accomplished but not be satisfied," Mandl notes. "There is more work to do and more opportunity to invest in the academic mission with resources saved from further reduction in energy use." Early and Barlett are co-chairing a new visioning committee to set sustainability goals beyond 2015. "We want to continue to be innovative in setting our new sustainability goals beyond 2015," Early says. "We want to continue to challenge ourselves." Kowal says two small-scale solar installations are set to be installed in the first quarter of 2015, and "we are continuing to evaluate the feasibility of co-generation on campus." "We will be piloting a window film technology project at the Woodruff Library. Another pilot will be an electrical device that is installed at the electric panel to reduce inefficiencies within the building electrical system," she says. Lessons learned in achieving this goal will pave the way for the next. "Achieving our energy reduction goal early shows that, when our community comes together around a shared vision, we can achieve what seems out of reach," Howett says. "It should inspire us all to believe that together we can build a sustainable campus and community for ourselves and future generations."